Why was the empire’s response to the barbarian invasions of the middle of the third century so feeble? It was largely a question of priorities. The biggest threat was perceived to come from the Persians. Put yourself in the position of Valerian it isn’t hard to see what he was thinking. Troublesome as the barbarians were they were basically out for loot and would return to their homes when they had enough. The Persians on the other hand were a sophisticated civilised people with a track record of empire building. They were ultimately intent on replacing Rome as a major power. If they invaded they were more likely to try and hold on to what they had. And they threatened the empire’s richest provinces. The Germans could wait. The Persians were the more serious danger. The crisis in the East was instigated by Sapor, a new Persian emperor who inherited his father’s vendetta against the Romans and pursued it with even more vigour. Armenia was an ally of the Romans and its king had effectively resisted Persian pressure for years. Sapor had him assassinated. The legitimate successor was an infant so Sapor marched in and installed his own man in the post. Effectively he had annexed Armenia extending his own power at the direct expense of the Romans. He then went further by capturing a couple of frontier forts directly from the empire. He could not have made his intentions clearer. Valerian responded by assembling a huge force to attack Persia itself. He would lead it in person – a clear indication that this was considered the main threat. When preparations were complete he marched through Asia Minor at the head of an invasion force. The Goths kept well out of the way when the emperor was about. This in itself shows just how easy it should have been to keep them at bay. The Persians too should have been easy prey. But in the event things did not go well for the Romans. This has been blamed on poor or even corrupt preparation by the emperor’s general Macrianus. There was also another outbreak of the plague that was rampaging at this time. In any event, Valarian found himself besieged in Edessa. An attempt to break out was beaten by the Persians. An offer of a large payment of gold was turned down. But it is characteristic of this time, that things that seemed as bad as they could be would take a turn for the worse. Sapor took advantage of a personal negotiation with the emperor to take him prisoner. This was an outrage to diplomatic practices – as much then as it would be now. But with the army on the point of destruction, there was nothing the Romans could do about it. Leaderless, they surrendered. The Romans could no longer even defend their borders. With the emperor defeated at Edessa, Sapor swept into the empire and ransacked Antioch. The Goths had already attacked some pretty choice locations, but Antioch was truly one of the major cities of the empire. Only Rome itself and Alexandria were bigger. The attack was sudden and unexpected with the Persian cavalry arriving while the inhabitants were enjoying a theatrical display. The other large cities of Syria were also wrecked by the Persians, with only Emesa putting up any resistance, and that being the population turning out to prevent to Zoroasterans desecrating their temple. The narrow passes of the Taurus mountains would have provided an ideal location to stop the Persian advance. But the Persians moved so quickly and the defence was so disorganised that the passage was conceded without a fight. The Persians pushed deep into Asia Minor and laid siege to Caeserea. It was under the command of Demosthenes who held out heroically until the city was betrayed: he only escaped by fighting his way out. A very rare example of any resistance being put up. Meanwhile one of the prominent citizens of the area now occupied by the Persians was trying to come to terms with Sapor. A local senator called Odenathus sent some lavish gifts loaded on camels to the potentate. These were refused – indeed thrown into a river. Personal charm wasn’t really Sapor’s thing. When his friendly overtures were refused Odenathus instead raised some fighting men from the villages of Syria and at last, started something resembling a fight back. In fact, Sapor was already beginning to retreat. His actions had been throughout those of an opportunist. There was little prospect of holding onto the newly conquered territory when the Romans had reorganised themselves. Instead he was simply devastating the area with the intention of weakening the Romans and carrying off as much portable wealth as he could lay his hands on. But the harrying of his retreat by Odenathus provided some crumbs of comfort to the tarnished honour of the Romans. It was probably not that significant militarily, but in a daring mission Sapor’s camp was raided and some of his treasure and a few women from his harem taken. The aim of concentrating on the defeat of Persia might have been a sensible one, but the outcome was a disaster. The emperor himself got the worst of it. Valerian was taken back to Persia where Sapor displayed him to the people in chains. He then proceeded to use him as a step to mount his horse. Valerian died not long after his capture. But even in death the humiliation was continued. He was stuffed and put on display in a temple. Gibbon casts some doubt on whether these stories are true. They are certainly gruesome and it would be nice to think that they were simply propaganda. But Valerian certainly was captured in an underhand and disreputable way. And he was not returned after the war. And Sapor did assassinate the king of Armenia. It doesn’t seem to me that unbelievable that Sapor would be capable of other unpleasant acts. He was certainly responsible for much destruction and inhumanity in his campaign in Syria and personally supervised it. I don’t think it is a stretch of the imagination to suppose he was vindictive as well. Gallianus did not seem too concerned about the fate of his father. “I knew that my father was mortal. Since he has acted as becomes a brave man, I am satisfied” was his reaction. Very stoic. He was now free to enjoy the throne alone, and seems to have done exactly that. He spent his time gardening, cooking and discussing philosophy. This was pretty much not the kind of emperor the times demanded. There were 19 separate rebellions against him, none of which succeeded but all of which weakened the empire. And the empire had become incredibly weak. There was a widespread famine which led to huge loss of life. The various military disasters coupled with the plague had reduced the land under tillage. Cities need to be fed. Every inhabitant needs feeding. If the food supply is disrupted it isn’t long before stocks of food run out and people start dying. Analysing the documents suggests that half the population of Alexandria was lost. At its peak the city had 600,00 inhabitants. It is impossible to calculate how many died across the empire as a whole, but it is fair to conclude that if it had been today, it would have been a huge Oxfam operation. This was reflected in an innovation in the way that the Empire was governed. 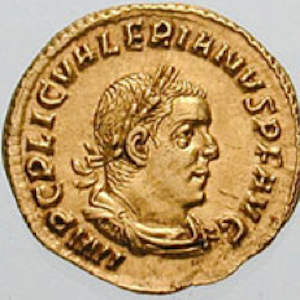 The heroism of Odenathus was recognised by making him an Augustus. This was also an acknowledgment of the fact that whatever the constitutional position he was in effective control of that part of the empire. Dividing the empire in various ways was to become quite a feature of Roman history in the future, but for now it was probably settled on as a pragmatic recognition of the facts on the ground rather than a long term arrangement. That Odenathus would leave his provinces to his widow Zenobia probably did not cross anyone’s mind. But that is a story that will be told later, there are still more problems to relate. In Sicily the slaves revolted. For a while they controlled the island. Order was restored, but inevitably food production was affected contributing to the general famine. The tribes of the Taurus mountains, the Isaurians, rose up in revolt. Initially they had supported a pretender to the throne, but even after he was killed they carried on their rebellion. They were tough and warlike, and in the end it was necessary to build a string of forts around them to keep them from attacking more peaceful areas. So that is the crisis of the third century. And what a crisis. Every aspect of the Roman world was falling apart. It is hard to think of any state in history that has faced problems as great as this and survived.